Enjoying an otherwise normal family day with his wife and 13-month-old daughter in December 2016, peace was sent into chaos due to a choking incident. Although under the watchful eye of Alexandre Desemery, his daughter was a little too eager while eating her snacks (children have a tendency to put too much food in their mouths) and she started choking. Alexandre’s first indication that something was amiss was when his daughter started coughing in distress. A few seconds thereafter she stopped making any noises at all and was quickly in panic mode as her eyes silently pleaded with her father for help. Alexandre also had to recognize and quell his wife’s mounting panic. Being a patroller, Alexandre’s CSP training immediately kicked in. Picking up his child, Alexandre quickly launched into treatment mode placing her face down with her head lowered over his arm and leg and initiated back blows. During the administration of the second back blow, his daughter resumed making noises much to both parents’ relief. A crying child never sounded so wonderful! Alexandre’s daughter made a full recovery after having to be comforted by her parents and continued to eat her snacks and enjoy their family’s evening. Alexandre and his wife will forever be grateful to the CSP for its upstanding BLS certification and recertification program and the excellent hands on practical exercises that allowed him to perform lifesaving measures that night. 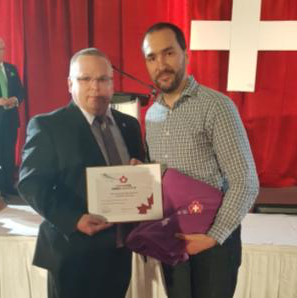 It was a great honour to present Alexandre Desemery with the CSP Lifesaving Award at the Central Zone awards banquet in May, 2017. This entry was posted in June 2017, Public. Bookmark the permalink.